Potatoes are probably the only vegetable we can find in any part of the world. It is versatile and all cuisines have utilized the maximum potential of this simple looking vegetable. Today DSB is creating a classic Cajun potato wedges with a mexican garnish, giving it a slight fun spin. This recipe is also part of “Virtual Vegan Linky Potluck Party”. The recipe is labelled under “Appetizers” category. Who does not like potatoes? Not many .. right? Well it is such an amazing vegetable to make that it is really tough to not fall in love with atleast some of its cooked variations. In Indian cuisine, many dish call for potatoes and it is part of some really amazing treats – from Pakoras (recipe here) and samosas to parathas (stuffed flatbread). Offcourse we then have a plethora of curries and stews which portray how many amazing transformation are possible with potatoes. This recipe though, is not from the Indian origin. I happen to try this recipe at a local event in Montreal and i liked it. It was simple and fuss free. They served it with a simple ketchup and mayo. The serving was rather big for my appetite and i carried the leftover home to eat the following day. Next day, i was fixing up some Nachos tex Mex (recipe here) and i prepared some salsa to serve along with it. 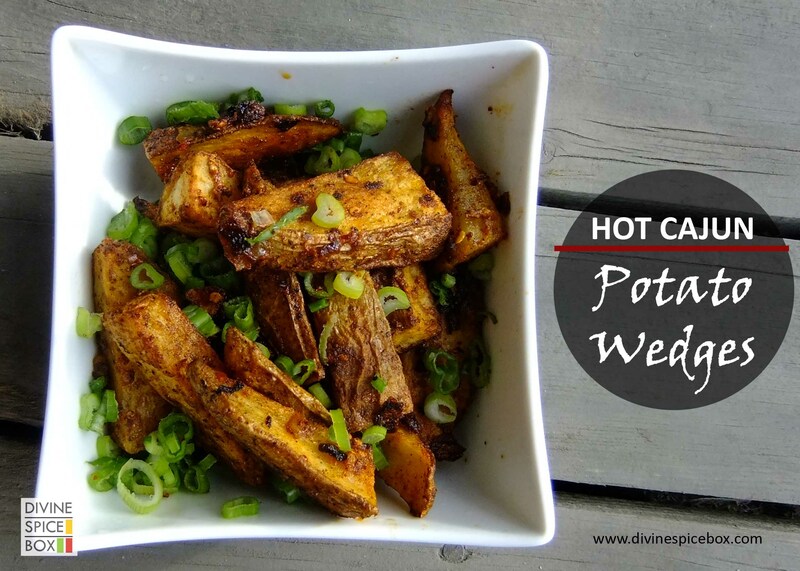 We tried these cajun potato wedges with the our cream and salsa and it taste so amazing that i got really enthusiastic about re-creating my version of cajun cuisine. This dish is my interpretation of cajun potato wedges. Since i did not have a recipe with me, this is what came out of my tasting and “hit and trial” sessions. I believe this is very close to what i had tried and liked that day. The dish is easy to prepare and requires very few steps. Prepare it once and i am sure you will fall in love with it instantly. This dish would use a cajun spice mix. Preheat the oven at 180 degree Celsius and keep ready for baking. In a pan, take the potatoes and to it, add the oil and the cajun spice mix. if you are using fresh garlic instead of garlic powder, add that in. Avoid both of them together or the dish would taste too garlicky. Mix well and ensure that all the potato slices are well coated. Now, take a baking pan/sheet and grease it with a little oil. Add the cajun spice mix potato slices on the baking sheet and bake in the oven for about 20 minutes. Check the status after about 20 minutes and change sides of the slices to ensure even baking. Bake for another 15-20 minutes. The baking time will depend on the thickness of the potato slice and the quality of potatoes. Potatoes with more starch content takes longer and is not easy to get crispy. For serving, Place the potato wedges on a serving platter and garnish with fresh, chopped green onions. Enjoy it along with fresh home made salsa and sour cream (can also try with tzatziki sauce, recipe to come soon) for the ultimate, yummiest experience. The word is YUM ! Absolutely yum. I am not a big potato fan but this dish is so good that no one can eat just one. It is almost addictive ! The best part is that the dish is easy to fix and is made using most of the common spices found in our kitchen. Me and my husband really enjoyed this with some home made tzatzki sauce(recipe to follow soon) and washed it down with some cool cucumber lemonade. It was a real treat. It is also a great appetizer dish to serve guests and is fuss free as it require minimum supervision. Make it at home next time you want to sit down for a home theater movie screening or have friends over for watching the latest world cup match. Read on the other wonderful posts from the Virtual Vegan Linky potluck party. Happy reading ! Tagged Healthy, Quick, Snack, Summer. I love cajun flavors. I am definitely trying this, Prachi!